It is that time of the year when lights dispel the darkness. As you prepare to celebrate Diwali, you are thinking of fi recrackers, burning lamps and fragrances of savouries. Of these, we all can agree that bursting crackers is a very fun Diwali activity. THIS YEAR, WE SUGGEST BURSTING CERTAIN MYTHS THAT STAND IN YOUR PATH OF WEALTH CREATION. Diwali doesn’t just mean bursting of crackers. There are many more activities to enjoy such as lighting diyas, making rangoli, spreading happiness among the less privileged, and worshipping Goddess Laxmi. Similarly, there is more to MFs than just investing in Stock Markets or Equities. MFs invest in various avenues like Equity, Debt, Fixed Income and even Gold. There is a wide range of Funds that purely invest in the above-mentioned categories and there are hybrids that invest in a combination of Equity and Debt in varying proportions. You can choose a Fund that matches your specifi c fi nancial Goal, risk appetite, and investment time. A lower NAV means that a Fund is cheap is a misconception. The NAV of a Fund increases or decreases on the price of its underlying assets (Equity, Debt or both). When you decorate your home for Diwali, you do not go only by the price tags, you check the quality and assess whether such accessories match the décor of your home. A similar approach should be taken while selecting Funds. The NAV of a Fund decreases with the rise or fall of the securities held in its portfolio. A newer Fund has a lower NAV vis-à-vis an older Fund because it had a shorter time to grow. Instead of using NAV as a parameter for Fund selection, look at other factors such as past performance record, comparative performance with peers, the benchmark index and Fund House pedigree. Just as Diwali can be celebrated by one and all within their means, MFs are for everyone as well. You do not need to have a lot of money to begin investing in MFs. 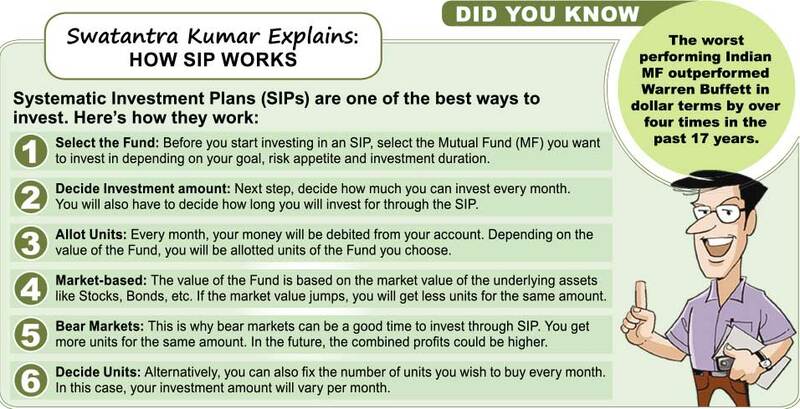 You can begin investing with only Rs.500 per month through the Systematic Investment Plan (SIP) route. You can fi nd a Fund that can meet your specific needs like Tax Saving or saving for a long-term Goal. You can increase the SIP amount as your salary increases. It is commonly believed that MFs are only long-term investments. This is true only if you tie your investment to an Equity MF to meet a long-term Goal. Just like you do not need to prepare all year long for Diwali celebrations, and can get started a few days ahead, so long as you plan right, you can meet your short-term Goals too by selecting the right kind of Funds. Equity MFs work best for long-term Goals as Equities provide the best infl ation-adjusted returns over a long period. You can use Debt-oriented Funds that invest in Fixed Income Securities with varying maturities to meet short-term Goals. You can invest in Funds such as Liquid Funds, Short-term Debt Funds and Ultra Short-term Funds to meet Goals that range from a few weeks to a year.